Finely chop the onion and mince the garlic clove. Heat up a little bit of olive oil and add the onion, and fry it for around 5 minutes. Add the garlic and cook for a further 2 or 3 minutes, then tip in the tomatoes and bring them to a simmer. Add the fish stock and bring back to a simmer. Season the mixture well. Place the bread and the cheese into a food processor and give them a quick whiz until they resemble breadcrumbs. 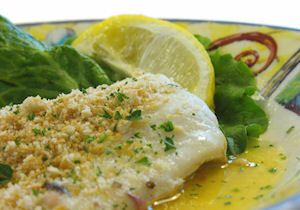 Place the haddock fillets into a shallow baking dish and cover them with the tomato sauce. Sprinkle the cheesy breadcrumbs over the top. Place the baking tray into the oven and cook it for around twenty minutes or until golden brown. So simple and quick when short of time. Added lemon juice to fish and fresh thyme (any spice or herb) to bread crumb mix. Lovely with wedges, had no fish stock so used white wine. Am looking forward to making this again soon with fish stock. Summary: This is a delicious one pot meal, perfect for midweek suppers. Serve it with a mound of mash or some spaghetti.